Bariatric surgery is a life changing decision that takes many people years to make. It is the most effective way to lose weight long-term and will drastically change your life physically, mentally, and emotionally. In order to prepare for the changes you will face along your journey, there are many essential steps you can take. Knowing that your commitment begins well before surgery will help you be that much more successful! 1. Research: Visit our website, read books and articles, come to our support group meetings, join our closed support group on Facebook and ask questions to our past patients. Our community of patients online can help answer questions you may have and they will give you real, honest, experienced feedback. 2. Make Changes to your Diet: Try to minimize snacking and focus on getting three protein centered meals throughout the day. You can also reduce or eliminate high carbohydrate foods, fast foods, carbonation, caffeine, and sugar. 3. Understand your Insurance Policy: While we are in network with most major insurance plans, not all insurance plans cover weight loss surgery and the pre- and post-operative clinic visits. Insurance companies can have requirements for BMI, comorbities associated with weight, completion of a supervised diet, and more. 4. If you smoke or use tobacco/nicotine products, quit: Smoking and the use of tobacco and nicotine products affects how the body handles surgery. It has also been proven to dramatically increase the risk of complications during and after bariatric surgery. Additionally, smoking makes it harder for your body to heal after surgery because it decreases the amount of oxygen available to your cells. 5. Begin tracking your food and water: Keeping a record of your food and water intake can be very eye opening and give you a better understanding of your current eating habits. This will hold you accountable and help you reach your goals. There are many phone apps out there that can help you do this. 6. Drink more water: This is something many patients struggle with after surgery. Focus on trying to drink 64 ounces of water every day and make sure you aren’t drinking empty calories. Limit high calorie beverages, alcohol, juice, and energy drinks. Eliminate caffeinated and carbonated beverages. Stop drinking liquids with your meals and wait 30 minutes after a meal before drinking. 7. Find an exercise plan that works for you: If you don’t currently exercise, start small and create a workout routine that works with your level of fitness and physical ability. You can take a walk, walk up and down your stairs at home, do chair exercises, do arm workouts while watching tv, etc. The most important thing is to find something you enjoy doing and stay consistent. 9. Change your relationship with food: Learn to stop eating your feelings, do not think of food as a reward or a punishment. Think of eating as fuel for your body. Our body needs nutritious wholesome food in order to have enough energy to do day-to-day tasks. Make sure to eat mindfully and focus on eating slowly and chewing your food. 10. Focus on your mental and emotional health: Make sure you are emotionally and mentally ready to make this change in your life. 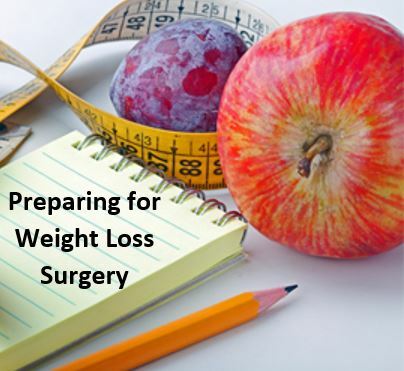 Ask yourself why you want to have weight loss surgery or what factors have contributed to your weight? You may also want to create a support system for yourself that will help you make positive healthy decisions. Find new hobbies that you enjoy that don’t involve food – check out this blog: “Fork Free Hobbies“. Set some goals for yourself and remember – small steps lead to big victories! Therapy! I saw Dr. Coker like 4 times and then I saw a therapist from February- November of 2018. Surgery was in July 2018. It helped me manage my emotions before and after. If you are ready to take the next step toward the future you click here to sign up for our free informational weight loss seminar! If you would like to speak to someone about our program please call 913-676-8492 and Katie will be able to answer any questions you may have.